"...the one tool every builder needs..."
The WatrLevel is the perfect tool for any leveling job - ideal for contractors, home owners and Do It Yourselfers. The WatrLevel is easy to use, accurate, fast, and built to last. 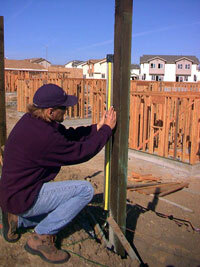 No other tool can level two points so fast, whether 6 feet or 100 feet apart - and even around corners! You'll snap a level line faster than you've ever done before! Vertical Measurement without Resetting +/-44" +/-8" +/-20"
Measurement Resolution 1/16" 1/32" 1/32"
Tube Diameter (OD) 5/16" 5/16" 5/16"
Ships via FEDEX ground or USPS. US orders only in contiguous 48 states. Alaska and Hawaii residents inquire HERE. Introducing the next-generation WatrLevel: a simple, reliable, and inexpensive leveling tool offering exceptional accuracy and ease of use. Builders Websource® recently tested this new and improved version, including the compact new A24 model. We were so impressed by its elegant simplicity and many practical uses that we have arranged with the manufacturer to offer it to our customers at a special all-inclusive price. Ideal for virtually any leveling job, the WatrLevel A48 and A24 are indispensable tools for every contractor, builder, trades professional or homeowner. Like your cellular phone, you'll wonder how you ever managed without it! The WatrLevel is so easy to use, can I trust it? Absolutely. The concept was first developed almost 40 years ago and has been in use for years in a wide variety of projects. Only recently has it been manufactured for public consumption. Even experienced builders are impressed when they first see the WatrLevel in action. The patent-pending WatrLevel works very well and requires no batteries. If you are not fully satisfied with your purchase, we'll refund your money in full with no hassles! How does the WatrLevel work? By nature water seeks equilibrium. The colored water in the precision measuring staff seeks the same level as the water in the jug. So long as the water moves freely in the tubing between the jug and staff, the elevation at each end will always be exactly the same. The WatrLevel uses a measuring staff with a moveable scale. This encased scale sets the WatrLevel apart from other water levels you might have used in the past. When you match the zero point on the scale to the water level in the tubing (we call this set-zero) you effectively transfer the water level in the jug to the water level in the staff. Wherever you place the measuring staff you compare that point to the point you originally set to a zero reference. The result is the relative change in elevation between the two points. The WatrLevel is very accurate. Error margins are as small as 0.0013" to 0.0470" (less than a 1/16") and are distance independent. These tiny errors are only dependent upon changes in staff elevation and are insignificant for all practical purposes. Errors occur when water is either drained or added to the bucket. The worst case is when there is a change in measurement elevation of +/- 44" (the maximum range of the staff); in this case the water in the jug is either raised or lowered by 0.047". Most changes in elevation are less than 44" and the corresponding error is insignificant. For more detailed specifications see the SPECS. How does the WatrLevel compare to laser levels and transits? In many applications, the WatrLevel is all you'll need to set a precise relative elevation -- even around corners where laser levels and transits fall short. The engineered heavy-duty aluminum extrusion provides exceptional rigidity and precision. Laser levels and transits rely on degrees of measurement. They must first be set up and leveled properly; then they either shoot a laser beam against an object or a scale is viewed optically. If either one is off by even a small angular amount, the corresponding error will be significant (a one-half degree error in set up results in an error of 10.50" at 100’). Also, these tools require line-of-sight to be used, that is they do not work well around objects and corners. Furthermore, laser levels and transits require expensive re-calibration to ensure accuracy. Conversely, the Watrlevel can be used around objects and corners with no degradation in precision. Other advantages of the WatrLevel include its one-person operation, quick set up, and very low price. While laser levels and transits are important components of any professional builder, the WatrLevel is a basic necessity that's both easy to use and virtually maintenance free! My WatrLevel has channels on both sides. What are they for? The right side has a fractional scale; the left side has a decimal scale. Furthermore, the right side uses 5/16" OD tubing (good for distances up to 100’) and the left side uses 3/8" OD tubing (good for distances longer than 100’). In addition, the channels were designed so that the tubing can be replaced (in case you desire a longer length or the tubing becomes unusable). The WatrLevel comes standard with 50 or 30 feet of 5/16" OD tubing for the Models A48 and A24, respectively. How does the WatrLevel compare to other water levels? The type with a reservoir employs a jug (like the WatrLevel) and tubing, but no measuring staff. This means the level in the jug is your reference point, you hold up the other end of the tubing and wait for the water to settle and then mark. This method provides a single reference point wherever you take the tubing (same with laser levels), but no relative measurements. You are then required to measure from your marks to obtain any valuable information. With the WatrLevel you get instant measurements at every point. The types without a reservoir operate on the same principle. But since they have no reservoir and the water tends to move a lot, it's more difficult to establish a reference point or mark (and they usually require two people to operate). The third type -- the electronic version -- beeps when you lift the tubing when the water reaches the level in the electronic reservoir, again only providing a mark, but no measurement. There is a variation of the electronic type that provides measurements, but it is very expensive and no more accurate than the WatrLevel. Only the WatrLevel provides instant measurements at a economical price. Once you've set the original reference point, the staff gives you instant high or low measurements where ever you set it. And, unlike other water levels, it is not critical where you place the jug (or for that matter, even if the jug is level itself). The entire system is automatically self leveling. How important is placement of the jug? The WatrLevel requires only that the jug be placed within range of the anticipated high and low spots and that the tubing reaches all the areas you intend to measure. It doesn't even have to be level. This is because the level in the jug is transferred to the staff when you set zero. It should be noted however, that once you set zero, the jug cannot be moved or your reference point will move too. The WatrLevel comes in a box. Any significance to that? Water levels are notoriously difficult to pack away. There's the jug and all the tubing to contend with. The box for the WatrLevel has been designed so the unit can be put away quickly and neatly. Just drop it in the box, close the lid, and carry it away by the handle. It's not even necessary to remove the water! With the WatrLevel you can set up, take measurements, and pack up in seconds. Also, the box is designed under the UPS oversize limit, which allows us to include shipping charges in our flat low price! The WatrLevel comes with 50' feet of tubing (A48) or 30' of tubing (A24), how do I get a longer length? The WatrLevel is designed such that the tubing is replaceable. Just go to your local hardware store and buy whatever length you wish (5/16"OD for right side, 3/8"OD for left side). Pull out the old tubing, take the new tubing and dip it in a solution of dish soap and water and re-thread. It's that easy! Can I buy the WatrLevel in a store? The all new WatrLevel is available online right here at the Builders Websource! Range: +/- 44 inches (A48); +/- 20" (A24); adjustable reference. 0.1" and 1/16" (1/32" for A24) marked intervals with zero-line reference. Construction: durable natural finished anodized aluminum with clear plastic measuring tape protector. Will not bend or twist. approx. 50" x 11.5" x 5"